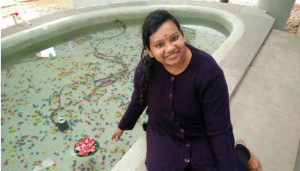 When everyone else was either out on vacation or cribbing about the rising mercury levels, this soft-spoken and unassuming senior research fellow from the Lab of Spatial Informatics has been winning accolades and creating waves at every international conference and workshop she’s attended in May, June and July 2018. Meet 26-year-old Salghuna Nair from Trichy, Tamil Nadu. It was the quest for an uncommon or atypical academic field of study that led Salghuna Nair to Spatial Informatics. “I wanted to pursue something different, something unique and trending. Hence, I signed up for a B.Tech in Geo-Informatics and Technology at the Bharathidasan University in Trichy. During B.Tech, I loved my stream and majored in Remote Sensing,” she says. Salghuna’s research has mainly concentrated on social issues and their solution(s). She was part of a land management project of the government in her B.Tech (NLRMP project, SAC, Harayana – 2013). Later, while pursuing her M.Tech at BIT-Mesra, Ranchi, she got involved with the ADAMS project (PHASE – I) 2014-15, which researched the reasons for drought and helped farmers accordingly. It was in 2015 when shestarted work as a Junior Research Fellow in a DST project that she joined IIIT-H for a P.h D degree. She is currently working on “Canopy spectral biochemical analysis of forest species using hyperspectral remote sensing – A study in Eastern Ghats, India” under Prof. P Rama Chandra Prasad. While narrating the run-up of events leading to her attendance at a workshop in Toulouse, France, Salghuna patiently explains the DART model. DART is an acronym for Discrete Anisotropic Radiative Transfer and has been patented by the Paul Sabatier University and CNES. From its official website, its application has been described as one that simulates measurements (images, waveforms) of passive and active (lidar) satellite/plane sensors, as well as the radiative budget, for urban and natural landscapes. ..It is very useful for the study and monitoring of land surfaces from remote sensing measurements.” DART is used by more than one hundred Space Centres such as NASA, CNES and others, as well as leading universities from Europe and the USA. 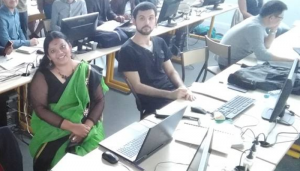 Since the model has useful applications in Salghuna’s area of research too, she contacted Prof Jean-Philippe.Gastellu-Etchegorry,who invited her to attend their annual workshop conducted in Paul Sabatier University. “Every year they select and train 15 students all over the world. This year, with this rare honour, I’m the first and only Indian to have attended the workshop since its inception 13 years ago”, smiles Salghuna. During discussions over the course of the 3-day workshop, Salghuna says that her research problem generated enough interest in the other participants. She was requested to present about her research and elucidate on her future plans of using DART in it. Like the name suggests, the Young Professionals Conference on Remote Sensing which was held at Eurogress Aachen, in Aachen (Germany) showcases works of people who have graduated in the last 15 years in all aspects of remote sensing. 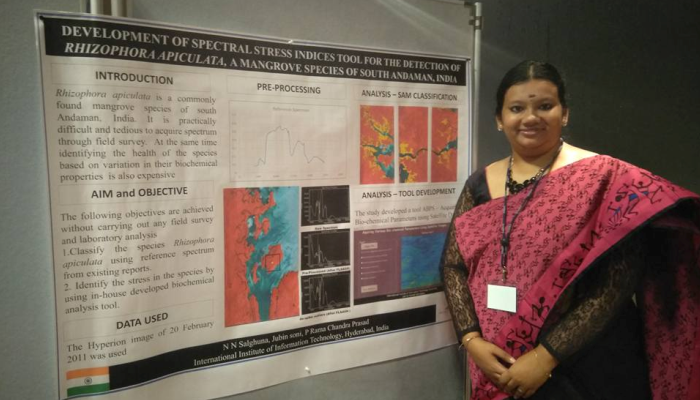 Salghuna’s poster on Development of Spectral Stress Indices Tool for the Detection of Rhizophora Apiculata, a Mangrove Species of South Andaman, India was much appreciated for its uniqueness and selected among the 12 best posters out of 48 on display. Quite by accident, Salghuna walked into another conference at the same venue just as it was concluding – the 12th European Conference on Synthetic Aperture Radar. Even though she was not a registered candidate, they graciously allowed her to attend and let her take part in a quiz contest too where she won the first prize! “Because I hadn’t registered, I was given the third place,” she says ruefully. However, she was made an offer of a job as well as a post-doctoral fellowship on the spot. At the recently concluded AIT 2018 conference (IX CONVEGNO Associazione Italiana di Telerilevamento) held in Florence, Salghuna presented a paper on A surrogate approach of identifying Artocarpus heterophyllus species of Attappadi forest, India. It explained a successful, alternative technique for identifying a particular tree species using hyperspectral images without tedious and expensive field and lab analysis. 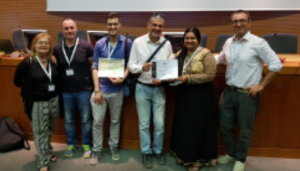 This paper was awarded the Best Paper award as well as Best Contribution among young researchers with a cash prize of 300 Euros. Owing her patience, strong sense of ethics, and simplicity to her immediate family, comprising of parents and grandparents, this lover of thriller fiction, says that she is personally very strong thanks to them. 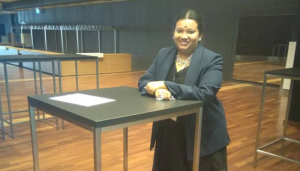 Professionally, she credits many role models who have inspired her with their teachings such as her class 10 Geography teacher, her class 12 class teacher, her M.Tech mentor and her current guide, Dr. Rama Chandra Prasad. The goal is “to complete my post-doctoral fellowship and eventually become a professor in my hometown of Trichy,” says this talented youngster. Hi Salghuna Nair, I felt very happy on listening to your posters explanation at R & D Showcase 2019. Your achievement are amazing and Great. Keep going, wish you all the Success in your career.